What Day Of The Week Is June 16? 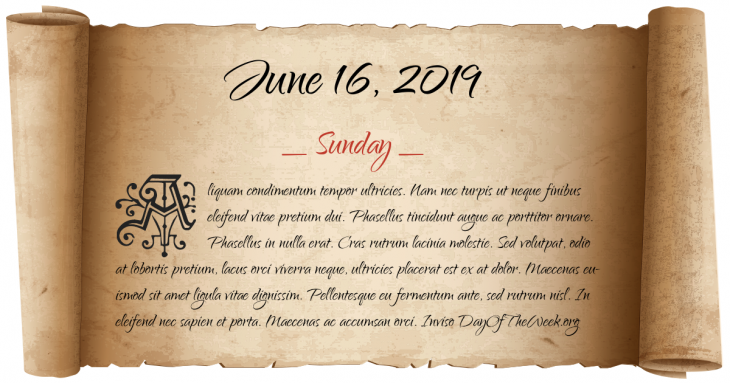 June 16, 2019 is the 167th day of the year 2019 in the Gregorian calendar. There are 198 days remaining until the end of the year. The day of the week is Sunday. Emperor Julian marches back up the Tigris and burns his fleet of supply ships. During the withdrawal Roman forces suffering several attacks from the Persians. War of Austrian Succession: Austria and Sardinia defeat a Franco-Spanish army at the Battle of Piacenza. World War II: Marshal Henri Philippe Pétain becomes Chief of State of Vichy France (Chef de l'État Français). Soviet Space Program: Vostok 6 Mission – Cosmonaut Valentina Tereshkova becomes the first woman in space. The largest single-site hydro-electric power project in Canada is inaugurated at Churchill Falls, Labrador. Imre Nagy, the former Hungarian Prime Minister, is reburied in Budapest. Who were born on June 16?